Posted Wednesday, August 15, 2018 by Eddy Goldberg & filed under WorkStations. We work with a lot of growing organizations looking for ways to create productive and affordable working spaces. Others stick with the traditional corporate style with private offices, administrative workstations and furnished boardrooms. We’re talking about the tv show “Suits.” Get the picture? In fact, Track Office Furniture has provided set furniture for popular tv shows including Suits and Designated Survivor. Of course, there are other ways to establish your office space. For example, even traditional companies like banks are using “hoteling” where all team members use chairs, workstations and tables on a temporary basis. It’s another sign of today’s mobile workforce. Here are ten steps to getting you to your perfect workspace. When it comes to furnishing your space, regardless of your layout, there are some key steps every growing organization must follow. • What impression do you want your visitors to come away with? • How do your teams work best? • Are your people in the office every day, or are they only there from time to time? You’ll be amazed that even creating this list will help you start making a path through the extensive labyrinth of office furniture choices you have in front of you. As your plan takes shape, think about flexibility. Don’t get trapped in the “come to work and sit at your desk” perspective. Imagine ways your people would share space: working remotely, “hoteling” or a shared table. Even some traditional companies like banks are using these modern approaches. Furniture can have multiple uses. Tables can be moved around for in-house presentations. Reception chairs can be moved into meeting space for team get-togethers. Most plans focus on where people will sit, but productivity really starts looking at where your work will be stored and accessible. Make organization part of your furniture plans. Keep files, storage and supply in designated places. Today’s workers need something more than furnishings – they need quick and dependable access to their communication tools. Every workspace – and don’t forget the meeting rooms – need power and communications access. It must be clean and organized. There’s nothing more bothersome than cords running everywhere. You strive for efficiency in your processes. As you should. But do you know that efficiency of people and processes begins with the efficient space? Absolutely. You may be used to putting your web developer in a backroom, but if people need to speak with that person every day, then it’s more efficient to have them in the middle of the action. Companies often get their workstations and chairs organized, but the supply closet becomes a cardboard box underneath the office manager’s desk. Storing and accessing your supplies is a key part of staying organized and it should be part of your office furniture plan. Pay attention to ergonomics to have an impact on the health and happiness of your employees. 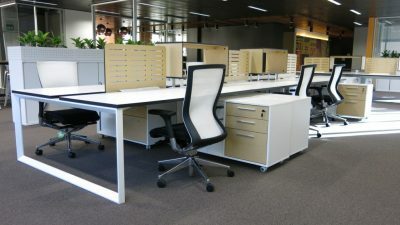 Adjustable chairs and desks keep people in proper form and productive. Your company will grow and change. The workstation you set up today will either need to be expanded as that function grows, or it will need to be made smaller to make space for new people. Either way, be sure to ask your furniture provider about the potential for adjusting the set-up. Your employees will love you for this one. We always see companies buying those $200 chairs you get at your local office supply store. Guess what? They’re back at the store in in 18 months when the chair falls apart. If they only knew that $350 would buy a used chair with superior comfort ad style that would last for ten years. And the most important part – your employees will love it! 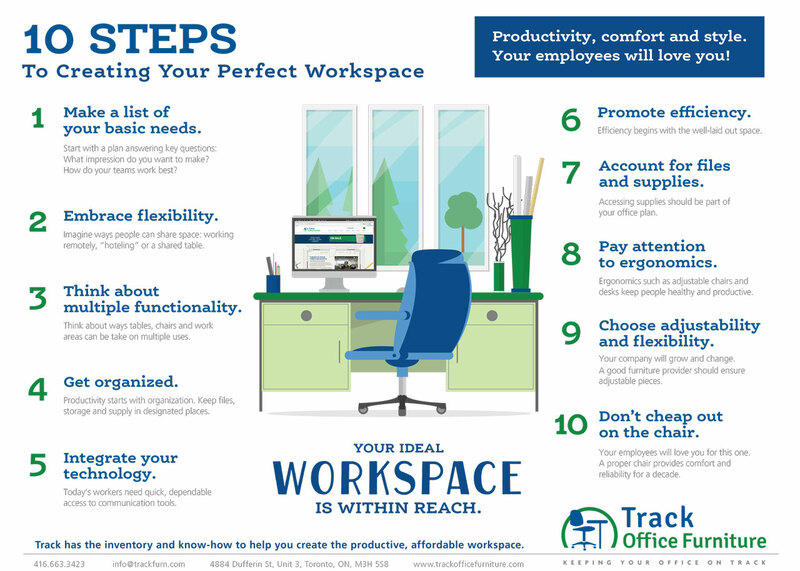 If you’re focused on a productive, affordable workspace, Track has the inventory and know-how to make it happen.